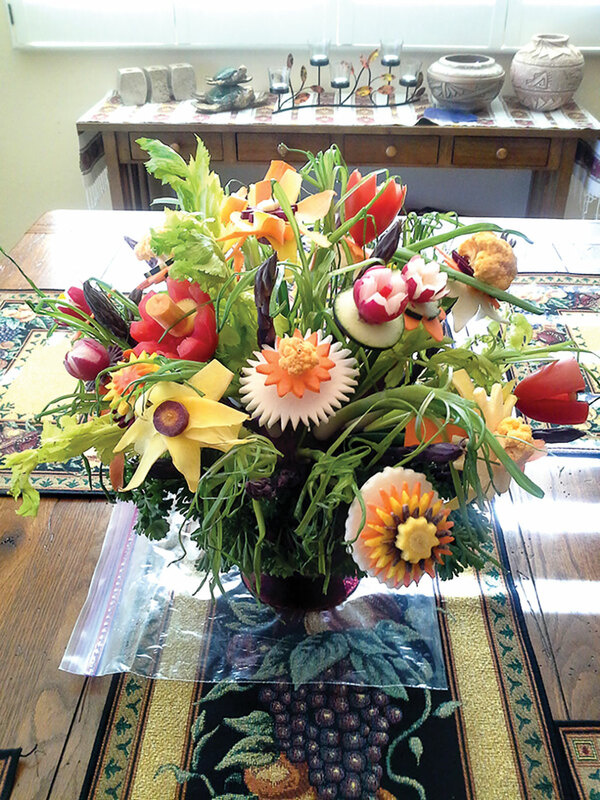 What would a festive Thanksgiving be without flowers and vegetables? In this case at the Thanksgiving dinner at Steve and Meg Haber’s home, the flowers and vegetables were one and the same. 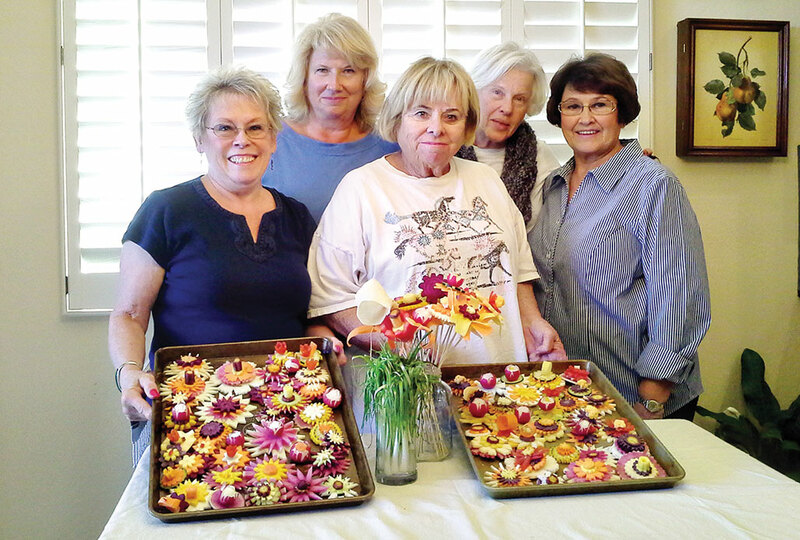 The queens of flower making were led by Jane Kihlstrom. The entire team was made up of Jane, Meg Haber, Janie Rath, Fran Flower and Barbara Crawford. The real stars of the flower making event were the vegetables. At least a dozen different vegetables were used to create a table center piece and the flowers for Thanksgiving plated items. Golden and red beets, turnips, rutabagas, zucchini, green onions, radishes, carrots of all colors, celery, parsley, kale, tomatoes, jicama, garden greens and a lot of time and effort created a beautiful backdrop for a delicious dinner. Each flower is created by cutting the vegetables into uniform slices; each slice is hand cut into a flower petal, and the petals are stacked to create a flower. The flowers are held in place with tooth picks, and for the tall flowers they are placed on wooden skewers. Each skewer is wrapped with green onions to create a perfect flower. The flowers are held upright by placing the wooden skewer into a head of cabbage. The cabbage is placed into a bowl shaped vase and secured in place. Thanksgiving is a time for sharing with family and friends. Here at Robson Ranch our friends are family.